power of your King, by the seven crowns and chains of your Kings, all Spirits of the Hells are forced to appear in my Presence before this Pentacle or circle of Solomon, whensoever I shall call them. Come, then, all at my orders, to fulfill that which is in Your Power, as commanded. Come, therefore, from the East, South, West and North! I conjure and command you, by the virtue and Power of Him Who is three, eternal, equal, Who is God invisible, consubstantial, in a word, Who has created the heavens, the sea and all which is under heaven. 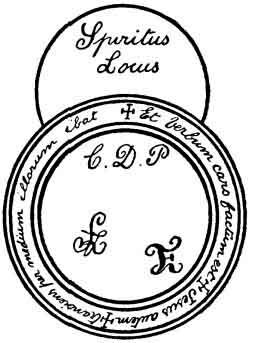 Circles should be described with charcoal or holy water, sprinkled with the wood of the blessed Cross. 1 When they have been duly made, and the words have been written about the circle, the holy water which has served to bless the same may also be used to prevent the spirits from inflicting any hurt. Standing in the middle of the circle, you shall command them in a lively manner, as one who is their master. O Lord, we fly to Thy virtue! O Lord, confirm this work! What is operated in us becomes like dust driven before the wind, and the Angel of the Lord pausing (sic), let the darkness disappear, and the Angel of the Lord ever pursuing, ALPHA, OMEGA, ELY, ELOHE, ELOHIM, ZABAHOT, ELION, SADY. 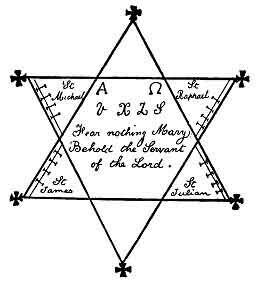 ADONAY, JAH, TETRAGRAMMATON, SADY. The earth is the Lord's and all those who dwell therein, because He established it upon the seas and prepared it in the midst of the waves. Who shall ascend unto the mountain of the Lord? Who shall be received in his Holy Place? The innocent of hands and clean of heart. Who hath not received his soul in vain and hath not sworn false witness against his neighbour. The same shall be blessed of God and shall obtain mercy of God to his salvation. He is of the generation of those who seek Him. [paragraph continues] Open your gates, ye princes, open the eternal gates, and the King of Glory shall enter! Who is this King of Glory? The Lord Almighty, the Lord, mighty in battle. Open your gates, ye Princes! Lift up the eternal gates. Who is this King of Glory? The Lord Almighty. This Lord is the King of Glory. Glory be to the Father, &c.
Behold your sentence! Behold that which forbids rebellion to our wills and doth ordain you to return unto your abodes. May peace be between us and you, and be ye ready to come, each and all, as ye are called to do my will. 280:1 On the hypothesis that the Method of Honorius is dealing in efficacious Rites provided that its conditions are fulfilled, the operation must fail because this requirement is unattainable, if not indeed impossible. I mention this point for the benefit of those occultists who may possibly believe in the efficacy. I do not think that they exist, but seeing that there is no end to occult foolishness, it is within the compass of a dream.